I’m still mourning the unbundling of Swarm from Foursquare, but Thursday’s Swarm update eases the pain a tiny bit. Foursquare made Swarm compatible with iOS 8’s Notification Center, so now users can check in to a place through the app’s widget. The widget also tells you which of your friends are nearby. If you’ve already downloaded Swarm, just swipe down from the top of your iPhone’s screen and tap the Today tab in Notification Center. Scroll down, hit Edit, and then add Swarm to your list of apps to include in your Today widget list. 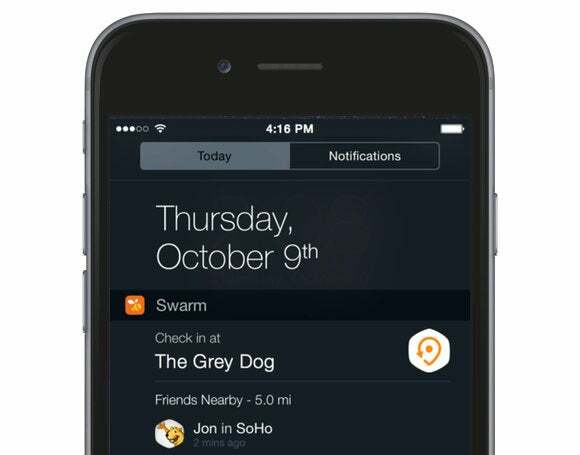 Swarm’s widget displays a check-in button next to your current location, as well as which of your friends are within a half-mile from you. Why this matters: When Foursquare housed both check-ins and location info, there was much more for users to interact with. But when the two split, users didn’t have much to do within Swarm once the check-in button had been tapped. Foursquare still has a wealth of information—I actually love its push notifications and new recommendation engine—but Swarm is a one trick pony. Now, that one trick lives in Notification Center. Users no longer have to launch Swarm on its own (unless they want to), and Foursquare found a way to make the check-in process less annoying. Everyone wins. Swarm's widget cuts to the chase: Check in, then see if any of your friends are close by. 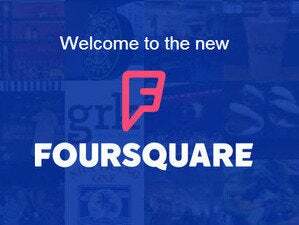 The separation of the two hasn’t gone over that well with the Foursquare community, but to Foursquare’s credit, the company has been quick to roll out updates to Swarm to make the whole process better for users. They first brought back leaderboards and mayorships between friends in July, and then decided to rank check-ins by type so you could compete against your friends from different cities. Now that iOS 8 has introduced deeper third-party app integration, Foursquare can look at the overall check-in experience. Swarm’s primary function is to serve as a check-in tool. It doesn’t tell you anything about the place you’re currently visiting—just where your other friends are checked in, and if any place nearby is “swarming” with tons of check-ins. So, launching an app simply to check in creates extra work for Swarm users. My biggest grievance with the new two-app system is that when you’re looking at a location’s reviews on Foursquare, you’ll still see a button to check in—but when you tap that button, it launches Swarm. What was the point of separating the two if they still rely on each other so heavily? With Thursday’s update, I can see the experience of using these two apps being a more fluid one, as you'll no longer need to leave Foursquare to use Swarm. When you get to a new place, swipe down and check in via Swarm’s widget, then launch Foursquare to read reviews and recommendations. Or vice-versa: Use Foursquare to find a nearby spot to go, then quickly check-in with Notification Center. Swarm version 1.3 is available in the App Store for iOS users running iOS 8.0 or newer.